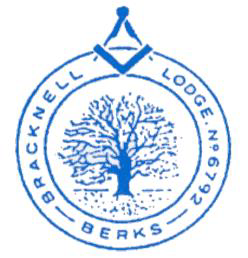 Bracknell Lodge was founded on the 11th March 1949 and meets five times a year on the second Thursday in January, February, March and November, and the fourth Thursday in September. The lodge meetings start at 5:30pm, with the September meeting starting at 5pm. The lodge emblem shows a Beech Tree and was designed by the Art Master of Raneleigh School at the time of the lodge consecration. The lodge emblem contains the word “Berks” rather than “Berkshire”, and when the design was approved in December 1948, the use of the shortened word “Berks” was not approved, however, it has not been changed and is still in use to this day. The lodge meetings used to be held at Church House, Rochdale Road, Bracknell. However, due to the expansion and rebuilding of Bracknell Town Centre, Church House was due to be demolished in 1971. The brethren of the lodge then voted to move the lodge meetings to the Wokingham Masonic Centre, where they continue to run.